A superb seafront summer house with plunge pool, direct access to the waters of the Ionian Sea and intoxicating views. Picture yourself in the plunge pool... a glass of chilled Sicilian wine in hand... the fire-orange sun setting into the sea... Mount Etna carving out a volcanic silhouette in the evening skies... Life at Estiva is good indeed! ² a communal multi-sport area with artificial grass. Inside: the main entrance of Estiva is from the large garden terrace and takes one into the spacious, comfortably furnished living room. Your eyes will immediately be drawn to the wide glass doors that give onto a covered terrace and offer beguiling sea views. The living area flows into a panoramic dining area, also with access to the covered sea terrace, and then on to the superbly equipped kitchen that looks over the terraced gardens. To the left of the living area a couple of steps lead up to a short passageway and the sleeping quarters, comprising: a master double with sea views, a double and a double-twin with garden views and three bathrooms, two with shower, one with shower and a perfectly positioned tub looking out to sea. Outside: on the "landside" of Estiva, accessed from the main entrance, is a large paved terrace surrounded by luxuriant vegetation and furnished for sitting, lounging and dining al fresco. It is on the "seaside" of the house, however, where you will probably spend most of your time. Here, accessed from the living and dining areas, is a superb shaded sea-view terrace, equipped with comfortable furnishings, a dining table and a well-equipped outdoor kitchen. 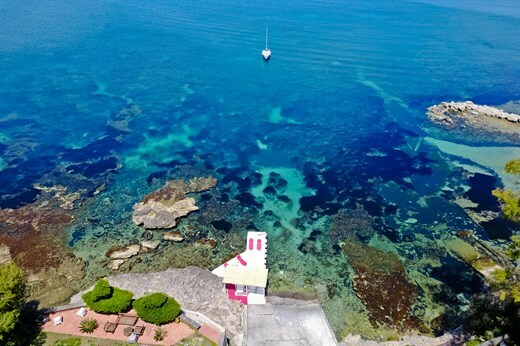 A step leads down from here to a small lawn and on to the inviting plunge pool, whose views take in a large expanse of the sea, the Gulf of Catania and Mount Etna. More steps lead down to the sea and a bathing platform which is lapped by the transparent waters of the Ionian Sea. The jetty and seafront area in front of Estiva is for guests' use but may be used by other people. The sunloungers provided, however, are for the exclusive use of guests staying at Estiva. 1. Siracusa, once the mightiest and most important city in Magna Graecia, now home to a fabulous archaeological site and an island centre, Ortigia, whose piazza ranks as one of the loveliest anywhere in Italy! 4. beaches galore: south of Siracusa, the coast is lined with beach after sandy beach! "The photos don't do Estiva justice. The gardens and seaside are amazing. We hardly wanted to leave the water and property. We wish we were there now. That about says it all. The memories of the sea and the views are my new happy place." Estiva is a really good villa with helpful and friendly owners. Great tech and well-equipped kitchen. Overall great experience. We would definitely consider again going with your company. Estiva was beautiful and very well equipped. We loved the outdoor kitchen. The view from the terrace was amazing and we had dinner at the villa most nights because it was so lovely. The owners were very welcoming and friendly. The owners were gracious hosts upon check in, just lovely, warm and kind. Truly felt welcomed in their lovely home. What a view and a great location for day trips! The photos don't do Estiva justice. The gardens and seaside are amazing. We hardly wanted to leave the water and property. The owner was extremely friendly and engaging. We wish we were there now. That about says it all. The memories of the sea and the views are my new happy place. The holiday was very well organized thanks to your team in London and in Sicily. The view at Estiva is quite breathtaking in its beauty. This, together with the understated luxury of the villa and the tranquillity of the setting, makes it a tough place to leave. The superb view, beautiful landscape, home feeling, easy access to a very clean sea combined with the generous kindness of the owner and the excellent food prepared by the in-villa cook all made our holiday unforgettable!! Estiva was a special place that we loved from the outset. Our holiday in Sicily was a truly memorable and fantastic experience from start to finish. The cook at Villa Estiva was superb. Meeting the owners as we arrived was so special and it felt like we were coming home- This trip to Sicily was a dream come true for me and my family to share together as we celebrated my maternal ancestry roots. Estiva exceeded all my dreams. The villa surpassed all expectations and really blew us away. It was stylish, luxurious and immaculately kept. The view was breathtaking, like something from a Bond film. No photos could do it justice. The whole experience was truly memorable. The owner and his manager couldn't have been more accommodating or helpful. We all enjoyed our holiday very much indeed. Estiva was great because it is a home. The owner was attentive and informative, really good. The kitchen was very well kitted out and the owner was charming and extremely welcoming. We loved being able to use the tennis court up the road. Generally fantastic, as scores reflect. In particular the owner was both welcoming and generous. On our next trip we will probably be looking for a property with full ensuite facilities for all three couples. Nevertheless, this property gets a 9 out of 10 from us. The setting of the villa is delightful. The owner was very generous, helpful and charming. We immediately felt at home in his beautiful place and enjoyed every inch of it! Every morning we were stunned by the beautiful view of the sea and Etna (should really be mentioned on the site)! We're coming again!!! We hope that says it all! La maison c'est très intelligemment conçue, très agréable à vivre. Sehr freundliche Besitzerin. Für unser Baby wurde alles bereit gestellt (von Spielsachen bis Lätzchen).